As the usage of technology grows in our lives, we inevitably are causing more demand on our home’s electrical equipment. If you are adding equipment that trips your home’s breakers, it is probably a good time to consider upgrades to your electrical panel. An increase to 150- or 200-amp service gives you room to grow. Hefty electrical equipment may need upgrades to your home’s breaker panel to support it. We can evaluate your home’s needs by checking the equipment and load on your current breakers and make suggestions and changes. New appliances, televisions, HVAC systems, computers, and kitchen gadgets are all common causes of a tripped breaker. It isn’t so much that new devices are using more electricity because in many cases gadgets and appliances are more energy efficient today. Many times it is just a numbers game – we are using more electric consumer products than ever before. 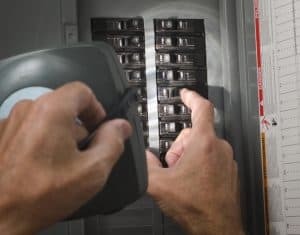 Most breaker boxes are 100, 150, or 200 amps. Add the amperages of all the individual breakers in the box. The total may be more than twice the total amperage of the box. Older homes often run low-amperage boxes because they didn’t have central air, modern appliances, or today’s electronics planned for in the design. Many homes with 60- to 100-amp units run close to maximum capacity. An increase to 150- or 200-amp service may be needed if you are expanding on an older home. You can see the amp load of a breaker by looking at the side of the breaker – commonly 15, 20 and 30. The wire size running to the amp and whether it is running 120v or 240v are all important in determining the max load the breaker can deliver. It is when you overload a circuit on a bad breaker that wires can heat up and cause fires – that is one of the reasons that breakers “trip” and shut down. It is possible that electrical panels malfunction and need replacing, but more often it is just a matter of being overloaded. Consider the additional power needs of any home renovation projects. Major appliances common in kitchen remodels can overtax the circuits that were not built to the new specifications. Garage door openers, outdoor lights, heating, and air conditioning systems may all require changes to the electrical panel requiring upgrades to meet the new load. You may need to add outlets to a wall, or 240-volt circuits for appliances and all of this wiring needs to match the max load of the electrical panel. It is possible that you need to add a sub-panel, move a breaker box or have extensive re-wiring done depending on what your project is envisioning. Electrical box regulations now require they be attached outside of the home. In a fire, firefighters can turn off the home’s electricity safely and quickly from the exterior. Homes more than 12 – 15 years old may still have indoor boxes. Moving a panel outside could be necessary and add to the cost of the project. Speedy Electric & AC services Arlington, Duncanville, Midlothian, Cedar Hill, Red Oak, Waxahachie, Mansfield, Grand Prairie, and the entire Dallas – Fort Worth Metroplex. Call us today at 972-775-6686 to schedule an appointment!